GK questions and answers from many topics of all subjects with explanation for interview, competitive examination and entrance test. Objective type questions with options and fully solved examples with detailed answer description, explanation are given and it would be easy to understand. 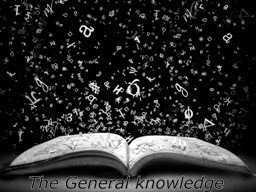 Select your interested topic and explore your knowledge on GS,GK And in current affairs topic.﻿The importance of general knowledge and current affair spans beyond being able to shoot off answers or start conversations. It makes you street smart and helps you take well informed decisions. GK & GS plays a pivotal role in a day and age where cities are thriving multicultural hubs. Adults too, may be able to better interact with people from different cultures and save themselves from embarrassment by having common knowledge about various cultural etiquette. The importance of GK percolates deeper than just being able to be a good conversationalist. Strong command over GK and current affairs will help you get rid of the fear of public speaking as you will no longer be worried about filling the long pauses and gaps. From being able to speak about interesting facts about a subject to holding a discussion with the audience, GK is a speaker's friend. There mere fact of being armed with well rounded knowledge can give a speaker's confidence a solid boost before and during a public speech.